To make the tart shell: Place the flour, salt and butter in a food processor. Process until the flour mixture resembles cornmeal. Add ice water and process until the dough just begin to stick together. Remove the dough from the food processor and press together to form a ball. Roll out the dough on a floured surface into a thin sheet; then transfer the dough to a 10-inch tart pan. Press into the sides of the pan. Brush with beaten egg. To make the filling: In a large mixing bowl, whisk the eggs well, beat in the milk, then stir in the garlic, basil, salt and pepper. Stir half of the cheese into the mixture. Set aside. 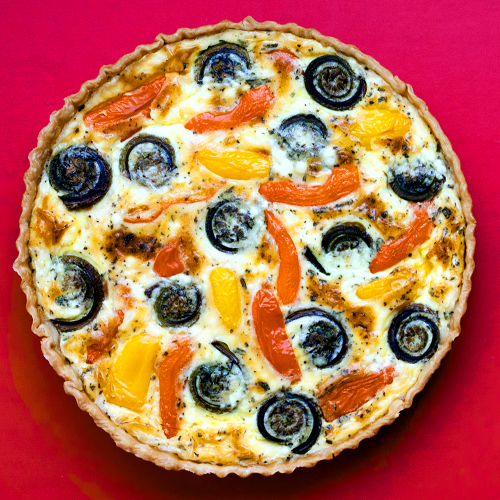 Place a layer of quartered sweet peppers across the tart. Add a layer of fiddlehead on top of the sweet peppers. 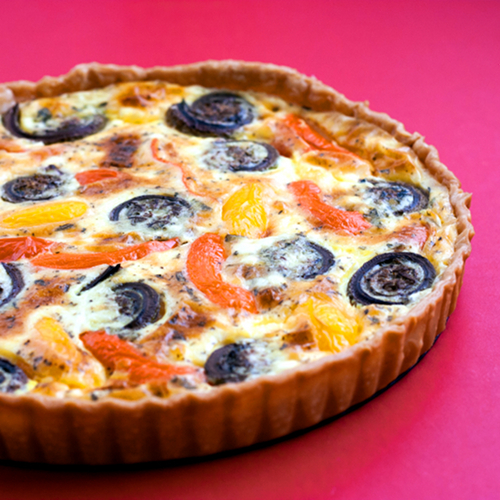 Pour the egg mixture over the sweet peppers and fiddleheads until it just rises to the top edge of the tart. Sprinkle with the remaining cheese. Place the tart on a baking sheet, bake in the preheated oven until the tart begins to bubble on the top and turns light brown, about 40 minutes. Remove from the oven and let cool for 10 minutes before slicing and serving. Oh I just love fiddleheads! I've only had them once, never could find them again haha but they reminded me of artichokes a little bit. Ooooh. Fiddleheads! I'm counting down the seconds until they finally make an appearance at my local market, now just because they're a sure sign that spring is finally here, but also because now I'm just dying to make this tart... love how it shows off their pretty curlicued shape! This is just delightful! Fiddleheads have such a unique flavor, I'm sure the7y married perfectly in that tart. Thanks, all. I grew up eating lots and lots of fiddleheads. Always love it!